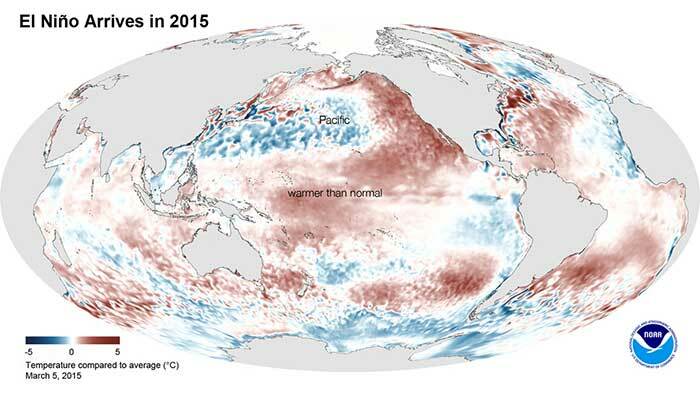 El Niño is a weather pattern that occurs in the Pacific Ocean. During this time, unusual winds cause warm surface water from the equator to move east, toward Central and South America. El Niño can cause more rain than usual in South and Central America and in the United States. El Niño is a weather pattern that occurs in the Pacific Ocean, but it is so big that it affects weather all over the world. Many fish that live in the normally cooler waters off the coast of South America move away or die. Fishermen first called this condition of warm coastal water and poor fishing "El Niño." El Niño means "the Christ Child." They call it that because it typically occurs at Christmastime. 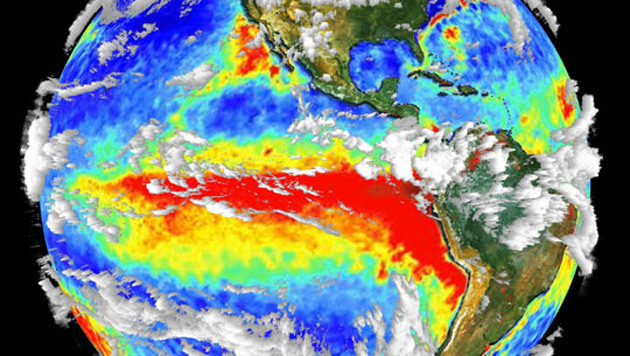 In El Niño years, lots of rain clouds form over this warm part of the ocean. These clouds move inland and dump much more rain than usual in South and Central America and in the United States. 3-D cloud and surface temperature data are combined in this image from the Terra satellite, which shows a well-developed El Niño condition. The red area is warm water sitting off the coast of western South America. Meanwhile, other parts of the world can suffer drought. Weather patterns all over the world may be unusual, making lakes out of deserts and charcoal heaps out of rain forests. How do we know what is happening to the ocean temperatures around the Earth? One way is to use data from weather satellites in space. One of the jobs of the GOES-16 satellite is to measure the temperature of the ocean's surface. Scientists use data from GOES-R series satellites--along with data from the MODIS (or Moderate Resolution Imaging and Spectroradiometer) instrument on NASA's Terra and Aqua satellites--to study cloud properties, land surface properties, sea surface temperature, fires, volcanic ash, snow cover, and sea and lake ice. This information about sea surface temperature can allow scientists to more accurately detect conditions such as El Niño while they are forming.